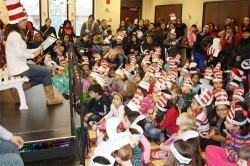 ﻿ Chicago Hispanic Newspaper, Lawndale News, Hispanic Bilingual Newspapers, Su Noticiero Bilingue » Dr. Seuss’ Birthday Bash! April 22, 2019 4:58 am You are here:Home Local News Dr. Seuss’ Birthday Bash! Posted by Editor on February 28, 2013 in Local News | Comments Off on Dr. Seuss’ Birthday Bash! North Berwyn Park District will be throwing a birthday party honoring Dr. Seuss and National Read Across America Day by teaching kids in the community the importance of literacy. On Saturday, March 2nd, all children will be encouraged to take a reading oath and partake in the fun. According to the National Assessment of Adult Literacy, the “average” American reads at a 7th or 8th grade level and one in seven adults have low literacy skills. The celebration will take place at the Community Center located at 1619 Wesley Ave., at 11a.m., to 1p.m.